Inside Pitch | The Real Scoop!!! Inside info and insight into the Game of all Games. Red Sox Traveling Secretary Jack McCormick can breath a sigh of relief. Manny, “his tormentor” is now a DODGER. The Dodgers jumped in late to replace the Marlins in the three team Manny derby. 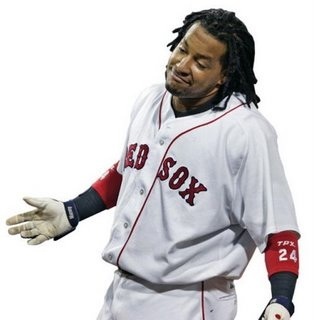 FoxSports Ken Rosenthal is reporting that the Boston Red Sox will get LF Jason Bay, while the Dodgers snag Manny Ramirez. The Pirates bounty will be 3B prospect Andy LaRoche, and RHP Bryan Morris (# 1 pick from 2006) from the Dodgers, along with reliever Craig Hansen and OF Brandon Moss from the Red Sox. 1- Red Sox get a much more mellow (to say the least) LF who is just a notch below Manny as a hitter, costs a third of the price, should fit in with the clubhouse chemistry-wise and was the top OF on the trade market. That said- the Red Sox just blew their playoff chances!!! 2- Joe Torre has a big grin on his face. The Dodgers just landed one of the three best right handed hitters in the majors (Pujols and A-Rod being the others). The Dodgers hung on to both Matt Kemp and Andre Ethier in the deal. They are the big WINNAS of this trade. They are now poised to skyrocket past the D-Backs and win the NL West. 3- Oh the lowly Pirates. First the bad— Brandon Moss is no more than a fourth OF; Craig Hansen the Red Sox 2005 # 1 pick is now the probable Pirates closer of the future (just what a bad team needs, a closer! ); 3B prospect Andy LaRoche hopefully can play another position because they just drafted 3B Pedro Alvarez with the 2nd overall pick. The Not So Bad— Bryan Morris was the Dodgers’ 1st round pick in 2006, is only 21 years old and has been very good at A-ball this year. The Good— Can’t really think of one. Maybe in 4 years I’ll change my mind. At least the Pirates have a minor league system again! lifelong Yankee fan wearing the # 60 in honor of his 60th birthday. ultra-long days of spring barely bearable for the baseball fan. To his credit, Crystal actually got ahead in the count, 3-1, against Pirates lefty Paul Maholm. While this moment might not ever be as memorably odd as 3 ft. 7 in. Eddie Gaedel stepping in the batters box for the St. Louis Browns; or Grandstand Manager’s Day, where thousands of fans got to manage the St. Louis Browns for a game through raised placards; or the White Sox’ infamous Disco Demolition Night, legendary major league baseball team owner Bill Veeck (the greatest baseball promoter of all-time) would have been proud. Exclusive Interview w/ NY Post Writer Joel Sherman at 12:00 PM Sunday! and the NY Post’s baseball writer, Joel Sherman. The routine mantra of most GMs is, “never give a starting pitcher more than a five year deal”. The thinking being that the proclivity for injury in that time span is just too high. But, if there’s one exception to that rule, it is probably Johan Santana– the best pitcher in baseball. SI.com and FoxSports.com have just confirmed a deal between the Twins and Mets for Johan Santana. The Mets now have a 72-hour window to come to terms with Santana on a contract extension. It’s believed that the Mets would like to sign the left handed 28-year old pitcher to a five-year deal, while Santana is seeking a six or seven year deal. If you consider that Barry Zito, who is ten months older than Santana, received a seven year deal from the Giants last season, Santana is almost a lock to receive the same length of contract. It is also highly unlikely that the Mets would agree to this deal if they weren’t willing to meet Santana’s contract demands. While the nuts and bolts are being fastened, Mets’ fans should expect to pop the champagne cork by this Friday at the latest. While the names of the players going from the Mets to the Twins hasn’t been confirmed, USA Today is reporting that the quartet heading to Minnesota will be, OF Carlos Gomez, SP Deolis Guerra, SP Kevin Mulvey, and SP Philip Humber. Jon Heyman of SI.com mentions that there has been talk of substituting swing pitcher Jorge Sosa for Humber, and there have been rumors that the the Mets’ top prospect, OF Fernando Martinez could still replace Gomez. However,giving more clout to the USA Today report is the news that the Mets did call Gomez back to the states the other day even though his winter ball team was in the midst of the Caribbean World Series. If the Mets indeed have dealt Guerra, Gomez, Mulvey, and Humber and we were to use the Baseball America’s 2008 Top Prospects list as a barometer, then the Mets would be dealing their # 2 (Guerra), # 3 (Gomez), # 4 (Mulvey), and # 7 (Humber) prospects for the right to sign the best pitcher in baseball to a deal that should be the richest contract ever signed by a pitcher. The contract will probably end up looking something like 7-years/$150 Million. So, rejoice Mets’ fans, it’s almost time to celebrate. Get ready to don your # 57 jerseys, break out your “You Gotta Believe” signs, the Mets just got a WHOLE lot better, and Santana-Mania is about to hit the Big Apple! gimpy CF who is on the better side of thirty worth in today’s market. Average prospects, and 2 Average prospects. them are LHSP, 2 of which are Gold Star, top of the line prospects. by Baseball America’s 2008 Top Prospects list, Beane traded his ace pitcher for the Diamondbacks’ # 1 (outfielder, Carlos Gonzalez), #3 (left handed starting pitcher, Brett Anderson), # 7 (outfielder, Aaron Cunningham), and # 8 (first baseman, Chris Carter) prospects, plus two average left handed starting pitcher prospects (Greg Smith and Dana Eveland). free-agent that the A’s would never have been able to afford. This deal might end up even better for the A’s than the Haren deal. 2008 Top Prospect compilation, OF Ryan Sweeney (Baseball America’s # 1 White Sox prospect in 2007), LHSP Gio Gonzalez, and RHSP Fautino De Los Santos almost assuredly would have topped the list. Anderson in the A’s rotation by 2009.
a member of the A’s rotation in 2009. $3-million, for the 2008 season. men in the AL when 2008 is all said and done. Mitchell Report Round Table- On Air! into the weakest free agent market since the days when the likes of Steve Kemp and Ed Whitson ruled the roost. did when I heard the Tampa Rays gave Troy Percival a two year/$8 million deal. will be joining the majors in 2008.
give him $48-million over 4 years to be there new right fielder. power when they come to the majors because of the bigger stadiums. platoon with right handed hitting Matt Murton. There’s always the possibility that he could play some center field also if youngster Felix Pie is still not ready, though he’d be a below average man in the middle. to be one of the best closers in the NL over the past two seasons. specialization, the bullpen has become more important than ever before. Almost every team seems to be on the look out for some relief pitching. offered to MLB bullpens, when they signed Shigetoshi Hasegawa in 1997. Sasaki in 2000. The Padres hit pay dirt with Akinori Otsuka in 2004.
left handed relievers in baseball when they signed Hideki Okajima. the low 90’s and likes to use his two-seamer to get right handers out. be the one putting the Ki-Bosh on lineups in the ninth inning. 2004, he has a 2.80 ERA and a 1.17 WHIP in 250.2 IP. likely replace David Riske as the Royals main setup man. much on Fukumori, offering him a 2-year deal worth around $3 million. become their sixth or seventh inning guy. fourth outfielder/pinch-hitter for a year or two. in the majors, somebody might just want to give Ishii another chance. then press play on the 11/25 show. was the first Japanese born player to play in the major leagues. pitched for the San Francisco Giants from 1964-65.